On the day that Somewhere Down in Texas arrived in my mailbox I hadn't planned on doing an album review but I figured I might as well get it done so I tossed ole George into the CD player. As "If the Whole World Was a Honky Tonk" filled up my listening space, I found myself thinking that I was most likely listening to what would soon become his fifty-second number one hit. This easy-going, personable singing cowboy never ceases to amaze me. After fifty-one number ones, and goodness only knows how many other wonderful songs George Strait has recorded, his voice is as familiar as the voice of a really, really good old friend and just hearing it come through the speakers reassures you that all is right with the world and life probably is unfolding as it should. There is something uniquely special about the poignant way his voice embraces each syllable and fills it with emotion before delivering it to your senses. Whatever it is, it is taken to a new level when Strait partners up with the, always delightful, Lee Ann Womack on "Good News, Bad News." For me, this was one of the highlight tracks of the album. The petite Ms. Womack, who co-wrote on this song, packs quite an emotional punch of her own and when you couple that with the evocative delivery of Strait; well, get out the tissues. That observation had barely registered in my consciousness when the first strains of "The Seashores of Old Mexico," a great tune written by the legendary Merle Haggard, began to play. This is one of my favorite Willie Nelson/Merle Haggard duets; now that is a tough act to follow but Mr. Strait manages to do so admirably. There were a few other tracks that stood out for me. Strait's emotional delivery on "Ready for the End of the World" gives the weepy fiddle some competition and the vocal harmonies are superb. This tune is classic country at its finest and sure to earn many dimes on the neighborhood jukebox at the corner bar. I guess the same can be said for "She Let Herself Go" with its clever lyrics and good hook set to very danceable music; a classic Texas two-stepper. 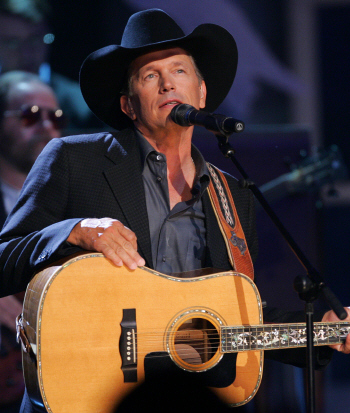 George Strait – Somewhere Down in Texas – no need to say anything more. His name is synonymous with success. George Strait - Somewhere Down In Texas track listing.